While this European country “Greece” is a quite costly tourist destination but will give you pleasure, fun and memories of heaven and there is no place like Greece on this blue planet. It is a country in Southeastern Europe with thousands of islands throughout the ionic and Aegean seas. Greece is very much famous for several ancient buildings of great architectural and historical significance. Athens is the capital of this country. This ancient country is purely dedicated to the goddess Athena, whom the people considered their patron. The name of the capital of Greece is “Athens” which is kept over the name of the goddess of this country Athena; Athens simple means the land of goddess Athena. Greece is considered as the birthplace of democracy in the world, western philosophy, historiography, western literature, major mathematical (Euclid’s Pythagorean Theorem) and scientific principles, political science, western drama and Olympic Games. There is so much to explore in this ancient country, the only thing you have to do is to book your tickets, pack your bags, grab your camera and leave for Greece because this time it’s Greece calling. 1. ATHENS – Firstly, welcome to the world’s fourth oldest city with its recorded history spanning more than 3400 years. By this fact about Athens, you can find this place full of ancient monuments, sculptures and buildings. Athens is considered as the symbol of Greece and very much of western civilization. If you are interested in history and architecture then Athens is a perfect destination for you. Athens was also the heart of ancient Greece and a powerful empire and civilization. In this city, we will also find Acropolis museum, national archaeological museum, sculptures, ancient jewellery, vases and many more interesting things from the ancient culture of Greece. The Ancient Agora, Kerameikos, the temple of Olympian Zeus and the Roman Forum are the major destinations in the city for Greek mythologists. 2. MYKONOS – If you are an avid or keen lover of beaches and their lifestyles, then Mykonos is the perfect place for you. Mykonos is the most famous island in the Aegean Sea and the most popular tourist destination in Greece. It is an island in the Cyclades group in the Aegean Sea of Greece and it is mainly popular for its summer party atmosphere all around the world. Paradise and Super Paradise are the major beaches of Mykonos where all the parties are conducted and people came here from all around the world to attend these parties. Mykonos is the one place that has the most rocking and awesome nightlife in Greece. 3. SANTORINI – Santorini is the Cyclades Island in the Aegean Sea. Santorini of Greece was devastated by a volcanic eruption in the 16th century BC. It is very famous for its beaches. Santorini is visited by 1.5 million people every year because of its cliff-top towns of Fira and Oia, which are amazingly beautiful and many of them are famous for movie locations too. It is a dreamy tourist destination because it has infinity pools, many beautiful beaches, eye-catching whitewashed buildings and boutique stays as we saw in our dreams. 4. METEORA – Meteora is located near the town of Kalambaka near Pineios river and Pindus mountains in Thessaly, Greece. 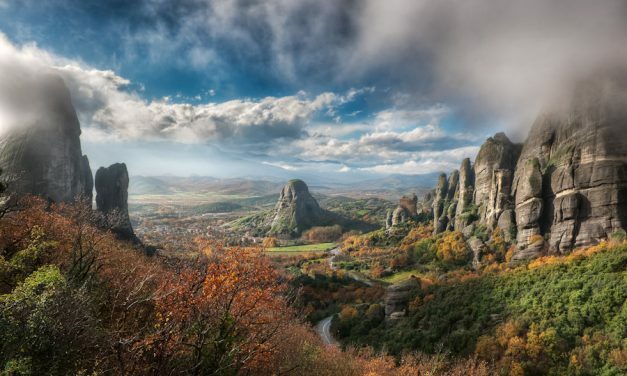 It is a rock formation in the central part of the Greece which is hosting one of the largest and very rapidly built large complexes of Eastern Orthodox Monasteries. This particular region is completely famous for such monasteries and natural beauty. In Meteora, out 24 monasteries, 6 monasteries were on a very immense natural pillar. Meteora is the UNESCO (United Nation Educational, Scientific and Cultural Organization) world heritage site. If you love to visit such places where you can find monasteries along with scenic natural beauty then Meteora is the perfect tourist destination for you. 5. DELPHI – Delphi is another UNESCO (United Nation Educational, Scientific and Cultural Organization) world heritage site in Greece. It is a town on Mouth Parnassus in the south of mainland Greece. Delphi is the ancient site of 4th century BC. Delphi hosts one of the most sacred sites for the worshippers of oracle god Apollo. This world heritage site is famous for ruins and remains of the stadium, theater and numerous temples during the Apollo time. Delphi is also famous of Temple of Apollo (was an oracle god, the prophetic deity of the Delphic oracle) which was erected by Spintharus, Xenodonos and Agathon.